Image: The entrance to the cave lies picturesque between green patures. In the front the Odin Vein crosses. Location: At the top of the Winnats Pass, a few kilometers west of Castleton, Peak District. 25km from Sheffield, 45km from Manchester. 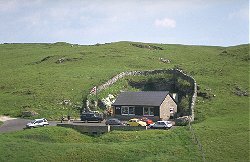 Bus to cave from Castleton free car park. The Mam Tor road is closed to traffic. From Castleton, go via Winnats Pass. Open: Summer daily 9:30-17:30, last tour 17. Winter daily 9:30 to dusk, last tour 30min earlier. Closed 25-DEC, 01-JAN, Boxing Day. Fee: Adults GBP 8, Children (5-15) GBP 4, Children (0-4) free, Family (2+2) GBP 22, Seniors GBP 6, Students GBP 6. Classification: Karst cave. Gem Mine. Guided tours: L=560m, Depth=65m, D=60min. Not suitable for people with heart conditions, bronchial illness or babes in arms. Bibliography: Arthur E. Ollerenshaw: Blue John Cavern and Blue John Mine, Castleton via Sheffield. The Romans discovered Blue John here 2000 years ago. 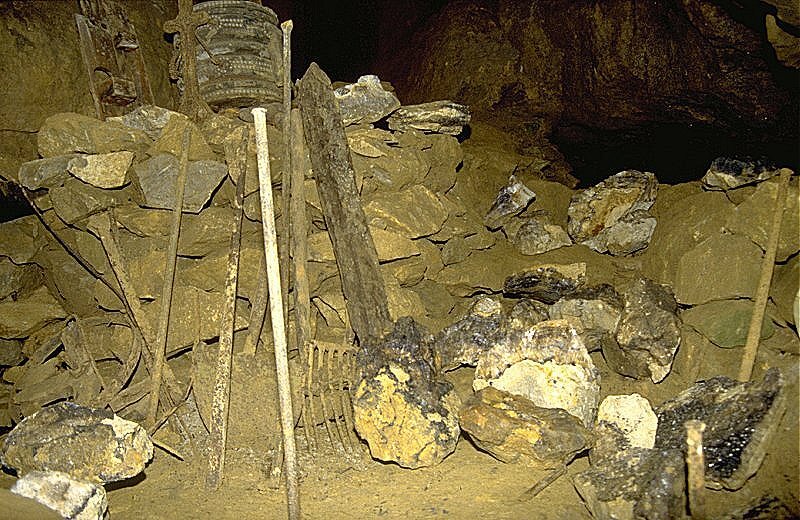 ~1700 local miners discovered Blue John Cavern while following the Blue John Vein. 1802 described by the eminent mineralogist John Mawe, Esq., in his work The Mineralogy of Derbyshire. 1884 The Original Blue John Craft Shop established. 1919 Blue John Cavern acquired by the Ollerenshaw familiy. Image: 19th century mining equippment and some examples of Blue John. 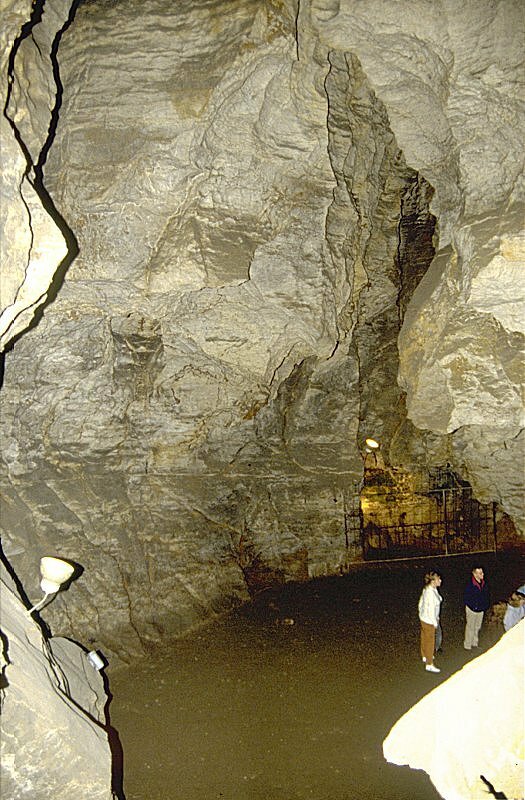 Blue John Cavern is a natural cave with some mine workings. Blue John is a unique fluorspar or fluorite, found only at Castleton, which makes it the rarest natural formation in the British Isles. 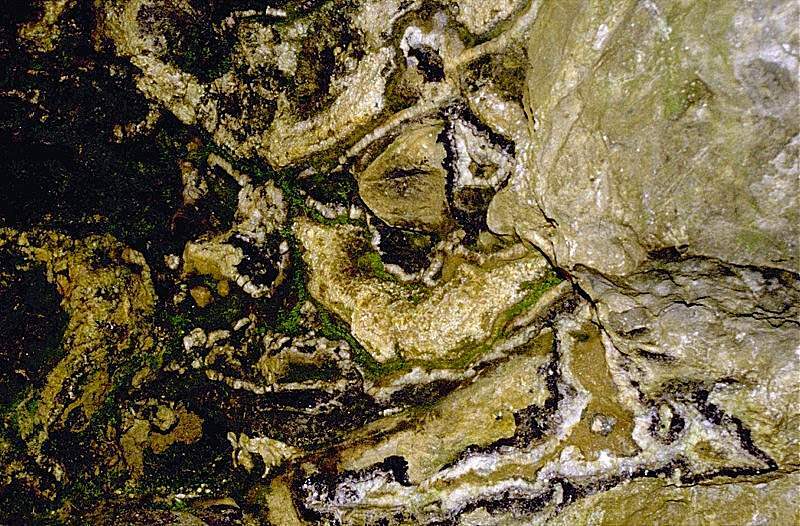 The mineral is found in veins in the limestone, 8 of the 14 known veins are located at Blue John Cavern. There are numerous legends how the rock was named Blue John. very likely was made up by John Kirk and Joseph Hall who worked the mines in the 18th Century. The Romans were the first to discover Blue John some 2,000 years ago. Two Blue John vases were unearthed during excavations of Pompeii. 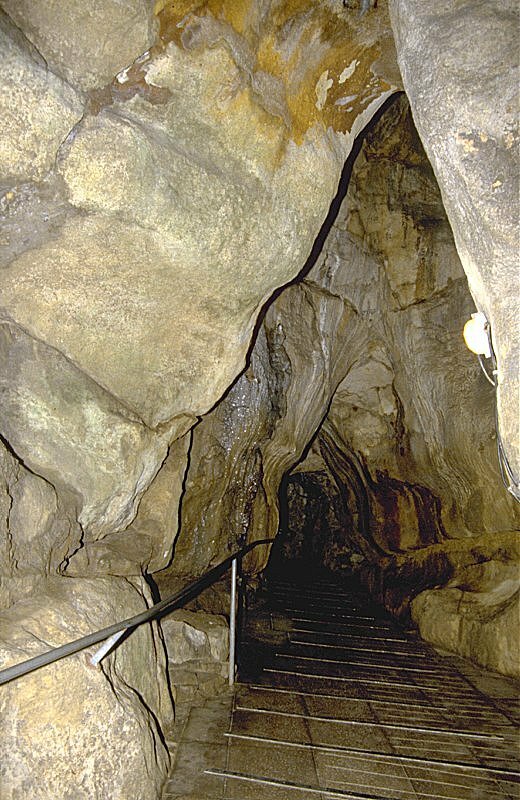 The path of the tour follows the dried up bed of the river that formed this cave. The river existed only for short periods during the ice age, it was fed by the melting ice of the beginning interglacials. Last time the river was running is more than 8,000 years ago. 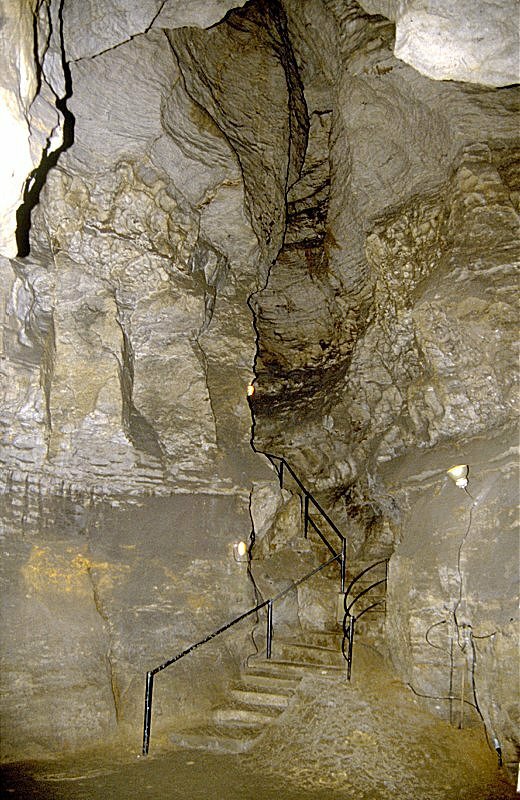 A mined passage descends steeply from the entrance into the natural caverns, and visitors can soon see the original vein of Blue John which the miners were following when they burst into the caves. 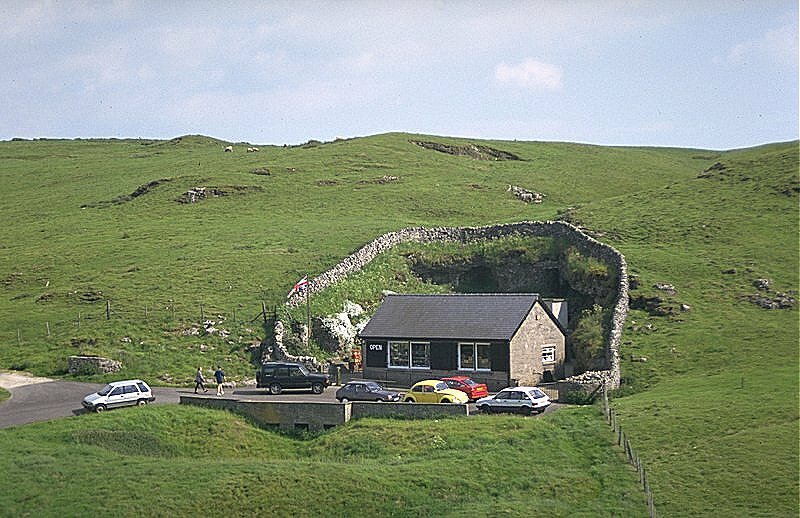 Of course the miners did not have a comfortable passage to walk down into the caves, and it is possible to see the original entrance, a pothole high in the roof. 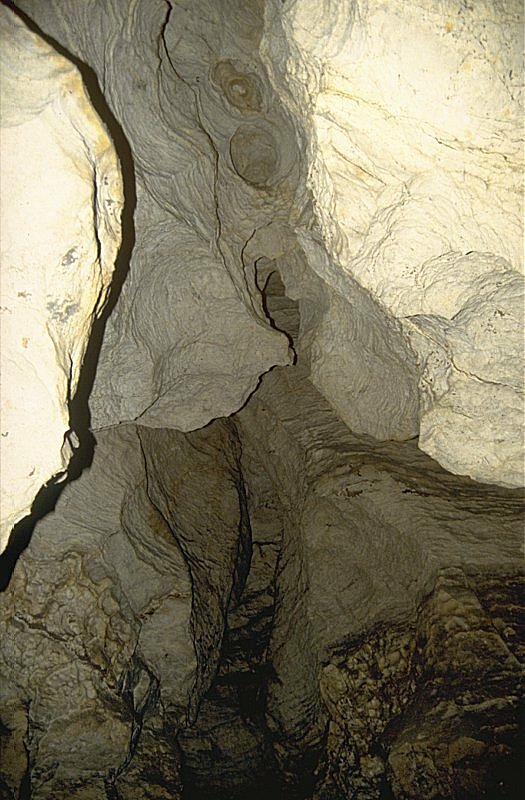 The first explorers were lowered on a rope into the caves down this aven. 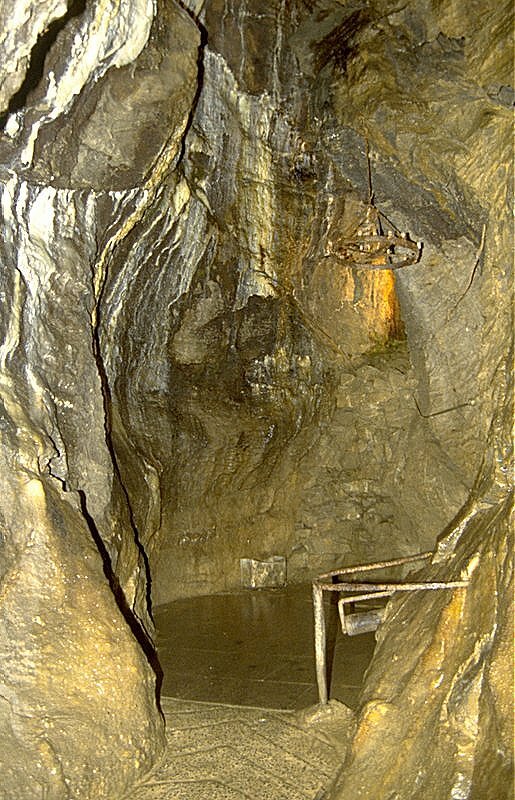 The action of water is visible everywhere in the cavern in the scalloping and etching of the rock walls. Soon the path follows the dried-up river bed itself. We are able to see relics of the old miners - a trolley, windlass and bellows, and some of the old workings where the best pieces of Blue John were obtained. These were used to make such things as vases, some of which were given to the Duke of Devonshire and the Pope, and can now be found in Chatsworth House and the Vatican. The sheer beauty of the caverns, such as the Crystallised Cavern with its lofty, dome-shaped roof, exotic mineral colourings and beautiful crystals, has to be seen to be believed. Indeed, the whole of the show section winds through many chambers, each one special and exciting, with wonderful formations and colourings. Finally, the Variegated Cavern is reached. Here it is possible to appreciate the force and power of the water which formed the caverns. Standing on a platform 20 feet above the floor, it is possible to look on into the blackness, down a vast hall, where only speleologists tread, littered with huge boulders, carried there by some long forgotten stream. It is not until one begins the trip back to the surface along the same route taken down the cave that one appreciates the depth one has descended. This cave descends for 214 feet, but the effort of reclimbing this distance back to the surface is relieved by the beauty of the caverns which are passed on the way. 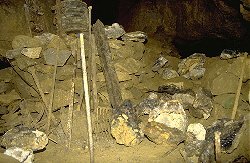 Search Google for "Blue John Cavern & Mine"
Blue John Cavern & Mine, official website.